Want to snowshoe to a beautiful frozen lake with a beautiful beehive shaped mountain looming in the background? 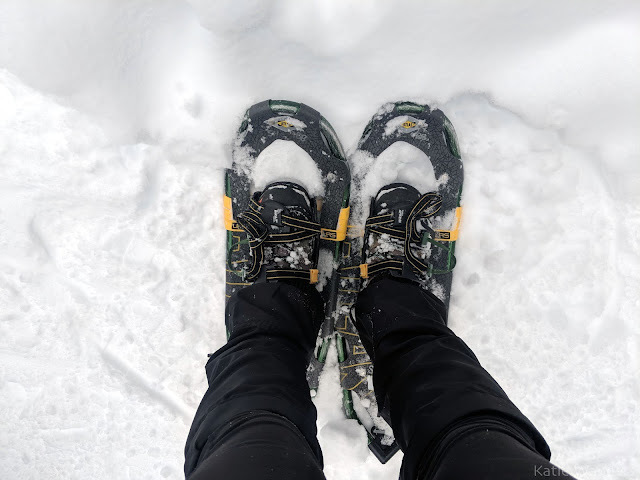 Do you enjoy a quiet trail where you will see no one - just the sound of your snowshoes traversing through the snow, deep in the woods, on a well marked trail? I know just the trail for you. 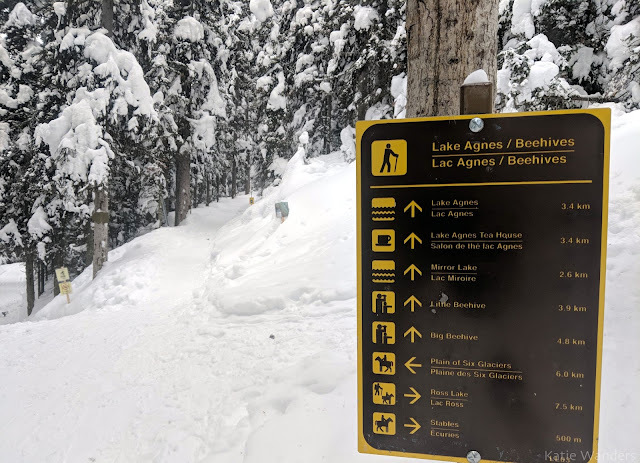 A winter hike to the Big Beehive and Mirror Lake will take you through the woods high above the lake, granting you a great workout, solitude, and in February in Banff, plenty of snow. 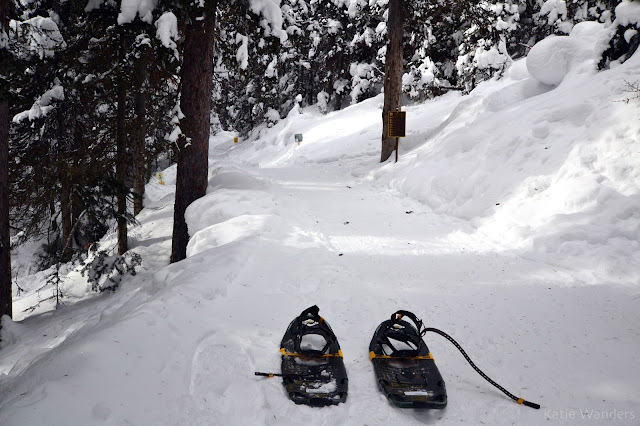 There are so many options when it comes to snowshoeing in Banff. As always, I recommend heading to the National Park information center first to get recommendations on trail conditions and avalanche areas. 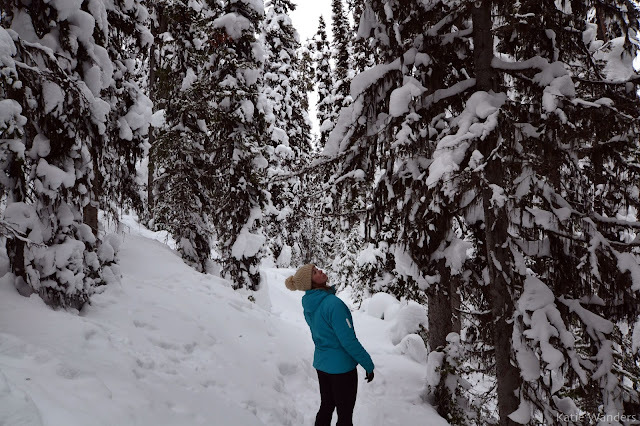 We had just finished our quick snowshoe of Peyto Lake Overlook and had spent some time enjoying the gorgeous views along Canada's Icefields Parkway. 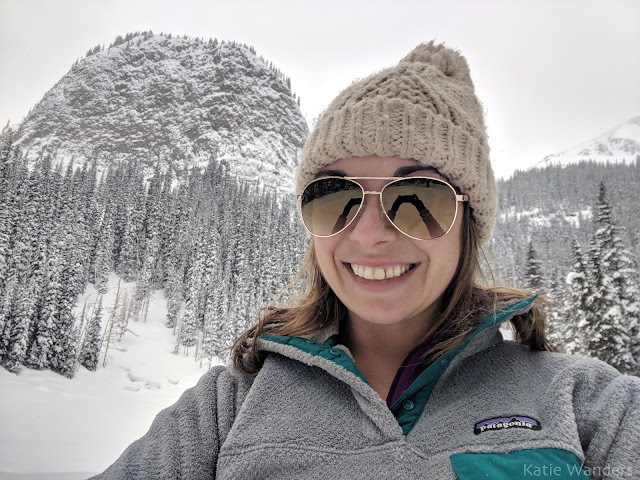 We wanted a longer hike on the way home that would throw some elevation and distance at us while also granting some of those famous Banff breathtaking views. Lake Louise fit this bill and let's be honest, spending time in Lake Louise will never disappoint. Trail: Lake Agnes hiking trail - From the Chateau Lake Louise, follow the main Lake Agnes trail as it rises through the forest. Sections of this portion of the trail cross avalanche terrain *see note below. Mirror Lake should be the turn around point for you. 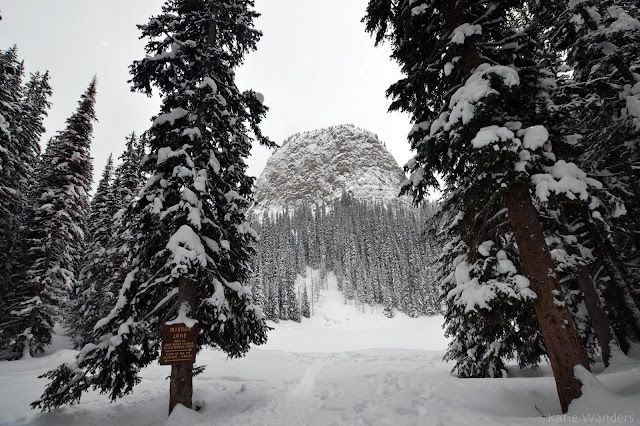 The trail beyond Mirror Lake, leading to the ever popular Agnes Lake Teahouse, travels through Avalanche terrain. 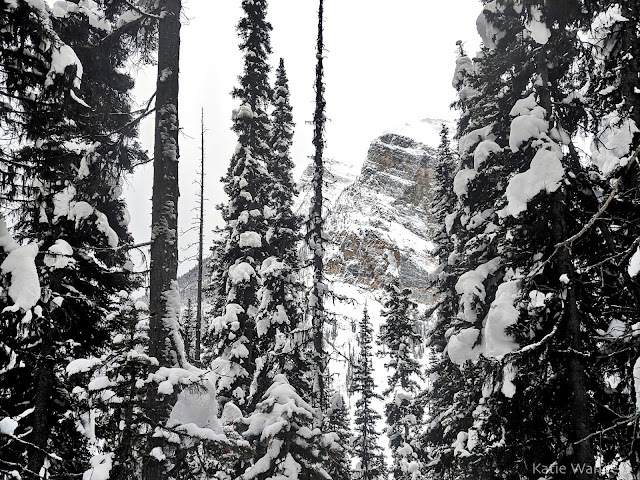 Banff National Park considers this area to be "Challenging Class 2 terrain for avalanche exposure" and requires appropriate training and equipment. Warnings advice to continue from here only if you’re prepared with a shovel, transceiver and the know-how. I am none of those things and being the rule follower, safety conscious, good example setter that I try to be, we turned around at the lake for safety and moral reasons. The trail is well marked and at least the day we visited, absolutely quiet. Except for the soft opera playing from the lake that is, a lovely touch we quite enjoyed). 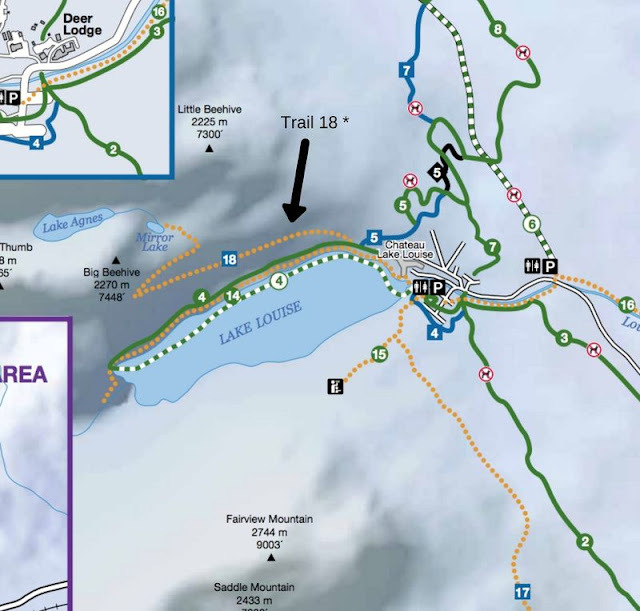 We saw one other person our entire time out on these trails and enjoyed tromping through the snow high above famous Lake Louise. You could get by without snowshoes but they were certainly helpful and as I mentioned during our other snowshoe, a fun chance to actually wear these contraptions in real snow on a trail. The trail winds through the forest, making its way up with peeky views of Lake Louise down below. Finally, you come to a clear where you see beautiful (frozen) Mirror Lake and the famous beehive behind it. Busy in the summer, but absolutely quiet and lonely in the winter. From here, you are crossing avalanche territory and will need to turn around and head back the way you came.